What hardware does ACRN support? How do I configure ACRN’s memory use? How to modify the default display output for a UOS? Why does ACRN need to know how much RAM the system has? LK (Little Kernel) is a tiny operating system suited for small embedded devices, bootloaders, and other environments where OS primitives such as threads, mutexes, and timers are needed, but there’s a desire to keep things small and lightweight. LK has been chosen as the Trusty OS kernel. Trusty OS is running in Secure World in the architecture drawing above. There are a few Hypercall APIs that are related to Trusty. Switch vCPU state between Normal/Secure World. 0 on success, non-zero on error. Initialize environment for Trusty-OS on a vCPU. Save/Restore Context of Secure World. By design, the User OS bootloader (UOS_Loader) will trigger the Trusty boot process. The complete boot flow is illustrated below. As per the Trusty design, Trusty can access Normal World’s memory, but Normal World cannot access Secure World’s memory. Hence it means Secure World EPTP page table hierarchy must contain normal world GPA address space, while Trusty world’s GPA address space must be removed from the Normal world EPTP page table hierarchy. Put Secure World’s GPA to very high position: 511 GB - 512 GB. The PML4/PDPT for Trusty World are separated from Normal World. PD/PT for low memory (< 511 GB) are shared in both Trusty World’s EPT and Normal World’s EPT. PD/PT for high memory (>= 511 GB) are valid for Trusty World’s EPT only. This design will benefit the EPT changes of Normal World. There are requirement to modify Normal World’s EPT during runtime such as increasing memory, changing attributes, etc. If such behavior happened, only PD and PT for Normal World need to be updated. 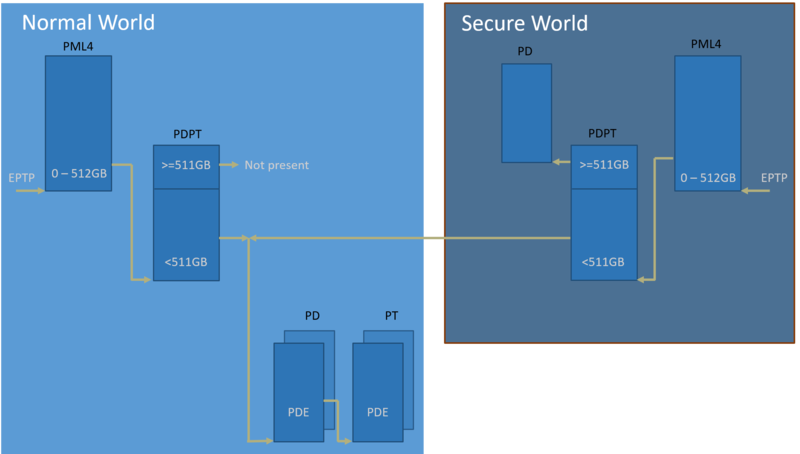 Create Secure World EPT hierarchy. © Copyright 2019, Project ACRN. Last updated on Apr 18, 2019.